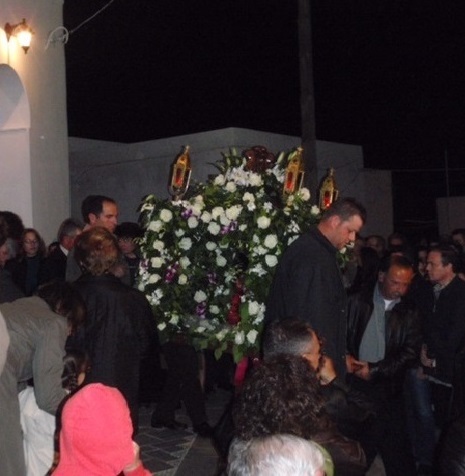 Since my early adolescence I attended Good Friday’s procession in the local Orthodox church of my neighbourhood, somewhere in the Northern suburbs of Athens. Back then I was participating in the ritual not because I was a believer but rather in order to enjoy the opportunity for social and cultural interaction. As time passed by, I realised that there is a magic in that gathering that spans far beyond the religious content and focuses on the personal, inner feeling of loss possessing healing properties, softening the perception of fatality. The release contains four tracks of field recordings made on Good Friday of 2012 in Athens at the Ekklisia Metamorphosi Sotiros church (https://goo.gl/maps/yutmP). The aura of devoutness is assisted by sound. Iterated resonant bells, priest and choir chants, the censers together with the soundscape of people, all contributing to the holistic experience of “inner escape” or inner soundscape. These recordings tried to capture that atmosphere of the inner soundscape, the one that can be created only by the gathering, the reciprocal participation.